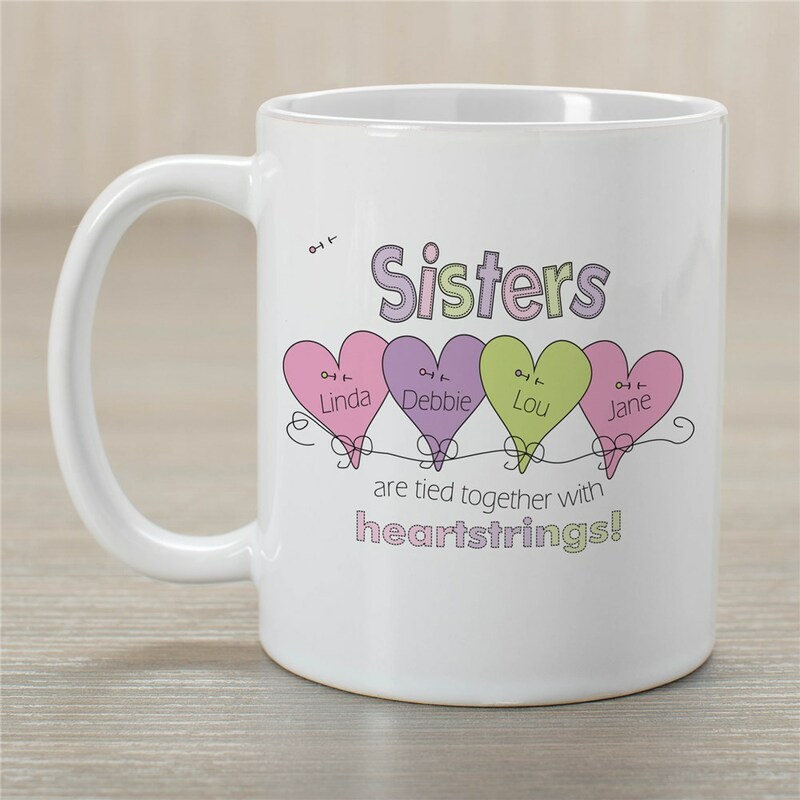 There is nothing better than spending some quality sister time than relaxing and chatting with your sister while sipping out of Sister Customizable Coffee Mugs. Every sister would love Personalized Mugs to remember past memories. These Personalized Sister gifts are dishwasher safe & includes FREE Personalization! Personalize your Mug choice with up to 6 sisters names. Mugs are available in different sizes ranging from 11 ounces. to 20 ounces. My sisters and I drank our coffee and tea from our mugs all weekend. It will help us remember our weekend as we use our mugs at home. To tell them apart, I put the sister's name whose mug it was in the first heart. Our mugs had five hearts. i am so pleased with the Sisters Mugs which I bought for our three daughters as a Christmas gift. The mugs are just as pictured, the lettering is clear, bright and exactly as requested. These mugs will be cherished as another connection between 3 sisters who live many miles apart but stay closely connected by memories, heart and love. So cute! Came just as pictured. Can't wait to give them to my sisters!!! Your sisters are so important and their names are displayed elegantly on our personalized sisters mug. Buy them for each of your sisters to celebrate your love for each other. These personalized sisters mugs make excellent gifts for your sisters on Sister's Day, Family reunions or just a special girls day out. We also carry many more Personalized Sister Gifts. Show your Sister how much you love her with our Personalized Sister Shirts & Sister Keepsakes! Shop GiftsForYouNow.com for all your Sister Gifts & Friendship Gifts!